When tiny particles strike a metal surface at high speed—for example, as coatings being sprayed or as micrometeorites pummeling a space station—the moment of impact happens so fast that the details of process haven't been clearly understood, until now. 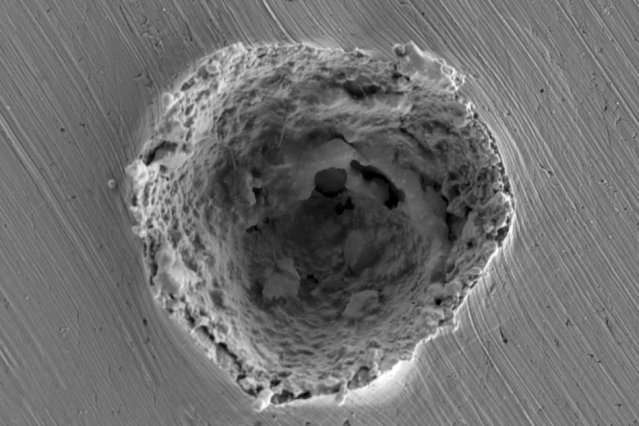 Mostafa Hassani-Gangaraj, an MIT postdoc and the paper's lead author, explains that high-speed microparticle impacts are used for many purposes in industry, for example, for applying coatings, cleaning surfaces, and cutting materials. They're applied in a kind of superpowered version of sandblasting that propels the particles at supersonic speeds. Such blasting with microparticles can also be used to strengthen metallic surfaces. But until now these processes have been controlled without a solid understanding of the underlying physics of the process. That's important information because the rule of thumb in industrial applications is that higher velocities will always lead to better results. The new findings show that this is not always the case, and "we should be aware that there is this region at the high end" of the range of impact velocities, where the effectiveness of the coating (or strengthening) declines instead of improving, Hassani-Gangaraj says. "To avoid that, we need to be able to predict" the speed at which the effects change. That could help engineers "to design materials for erosion protection, whether it's in space or on the ground, wherever they want to resist erosion," Veysset says. Melosh says, "The experimental work is of very high quality. … I could imagine that it might have applications to some types of surface milling, similar to sandblasting but more aggressive than that method." Interesting but what materials were the particles and the targets?